"Daphne is thankful for lazy Sunday afternoons." "Lady, is our little bundle of love, Shetland Sheepdog, which many refer to as "Shelties". We physically RESCUED Lady, along with her brothers and sisters when we heard the story of their pending death. The owners were just days away of destroying these starving, precious, helpless puppies. 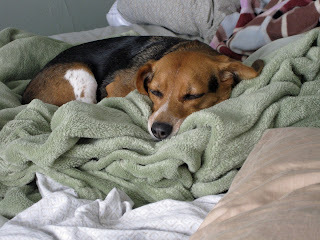 Once we had homes in just hours of their rescue, we jumped into gear at saving her mommy and daddy. We were able to rescue her mommy just days later, and the next day was one day too late to save her daddy. Horribly, he was run over with their riding tractor mower. It was incredibly tragic. 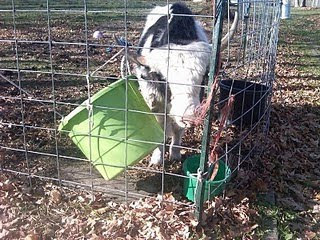 As a result of her mommy being starved while pregnant, and the severe neglect in Lady's early life, Lady was born Blind. Although many felt that she was worthless, to us, she was every bit of love and loyalty ! She was by no means worthless ! I would say that Lady's very Thankful for the saving of her life and her siblings. She is Thankful to be a loving member of our family ! As you view the early pictures of Lady as she grows, you will see one picture with her first tennis ball. Once we viewed this photo, we realized the 'name' stamped on the ball... " SURVIVOR". How fitting is that !!! She cannot see the ball, but she will ' listen ' for the ball hitting the wall, she then positions herself for the snatching of the ball as it rolls back to her. Its a blessing to watch her play. We have since adopted Ben, our yellow/white Lab, Benjamin Isaac. He has NO CLUE he is a furbaby...he is a member of the family, and thats that. LOL So now, about Ben......."
"Ben, our big furbaby boy, is a wonderfully loving and so devoted furbaby ! 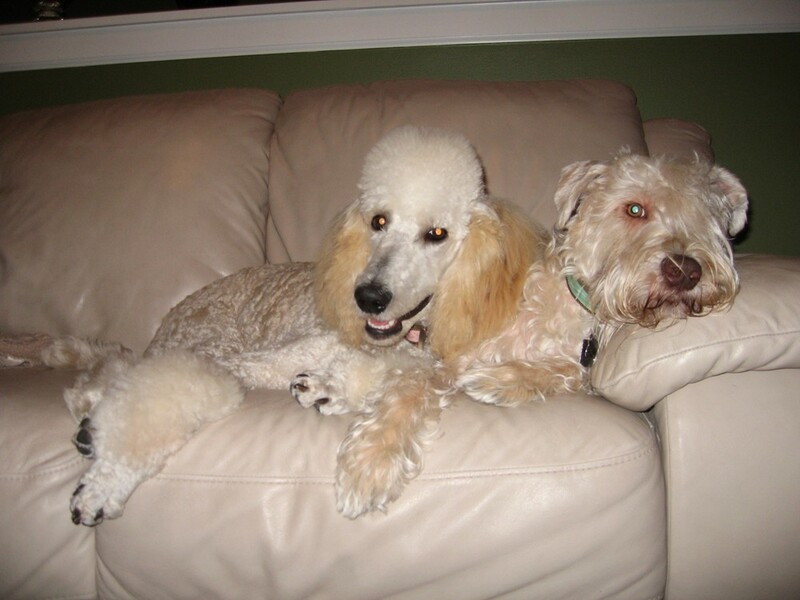 And yes, both our furbabies are furniture friendly, meaning they love it when you sit on 'THEIR COUCH' with them. :-) .... Ben has selftrained to take care of our little Lady. Ben will take his stuffed toy and lower it down to Lady so she can latch onto one of its limbs and he will guide Lady through the house. Its a blessing to watch the two together. Ben always lets Lady win at wrestling, even though he towers over her. Ben always runs for the high jump catching his frisbee, while Lady is standing close by 'listening' for Ben's collar to jingle, and she chases him in the direction he runs off, then half way, she stops.... listens....and when Ben comes back with the frisbee, he slows down for Lady to pick up the run again back to us. Its amazing to watch them. In one photo we refer to as 'SNOW BLIND' you will see Lady out in the midst of snow, waiting on Ben to return. So the story here, our little Lady is Thankful to be alive, to be in a home filled with love, to have a furbaby companion that takes care of her, and parents that can't imagine their home without her. And Ben, he is Thankful to be Lady's eyes, also to be a huge part of a home filled with love, with the same parents that can't imagine their home without him. I am not going to be the one to tell them that they are furbabies...they have no clue at all......... "
I'm just filling up space so that no one has to have an "unlucky" number. 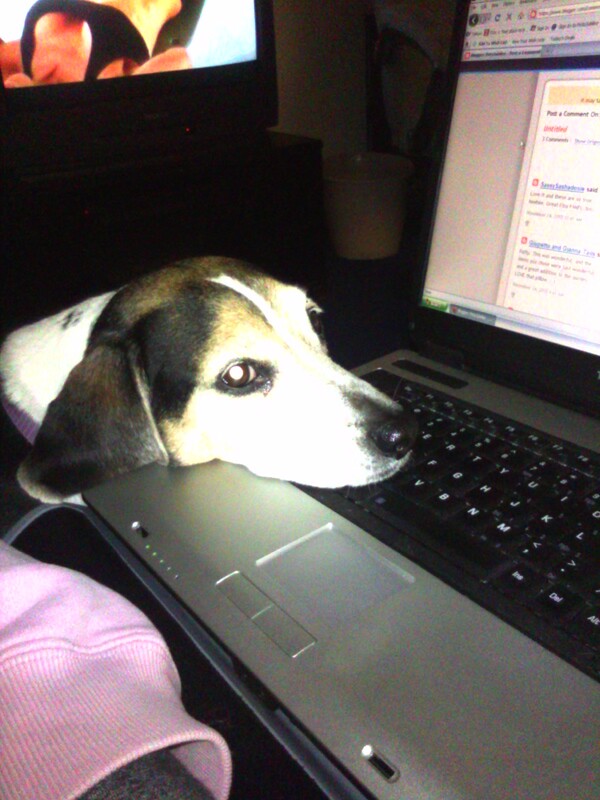 Velvet is thankful for a warm laptop on which to lay her head and for all treats. 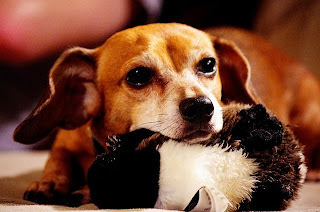 "When we adopted Jersey, a dachshund/chihuahua mix, it was clear that he had never been loved. His name was "Ricardo" - which he apparently was called for years - but he didn't even respond to it. He was bleeding from an injury to his neck, and the owners acted as though they never even noticed. We brought him home and renamed him Jersey - a name that he learned very quickly. It took him some time to figure out how to play - I don't think anyone had ever played toys with him! Now, he is surrounded by toys (like his goose in the photo). He carries them around and plays with them constantly, and I think he is thankful to have such a loving home." You see he was found left on the back door step of a GoodWill store, Of the three kittens he is sole survivor, His mommy has gone on to kitty heaven and was joined by his two sisters"
"Izzy the Wheaten Terrier is thankful for his comfy spot on the couch!! He love to just relax and enjoy watching everyone around him. Chloe the Standard Poodle is thankful for her little cousin throwing the ball for her!!! She love to play fetch, and is her favorite thing to do!" "Hotwheel is thankful for lil boys! Thankful that they feed me and play with me all day long till I pass out in momma's lap at the end of the day. Couldn't ask for better owners." "Our dogs are thankful for the snow! Freya is 12 weeks (beginning of the video) and Sissy is 17 weeks (end of video with Freya fully grown and Sissy playing). They're just a hoot and I can't help but laugh as Freya bounces through the snow in the video. Freya of course is now almost 2 years old and is a Lab/Heeler/Coonhound cross (whoever came up with that one should come meet her)! Sissy is a Heeler/BC cross, is 17 weeks old, and way calmer than Freya can ever hope to be!" "I woke up one day to find Arte the kitten sleeping in my potted plant! She looked really sleepy so I thought I would just let her stay there but when I got out of bed I made some noise and she woke up. She flopped one paw out, I took a quick picture and then she went back to sleep. 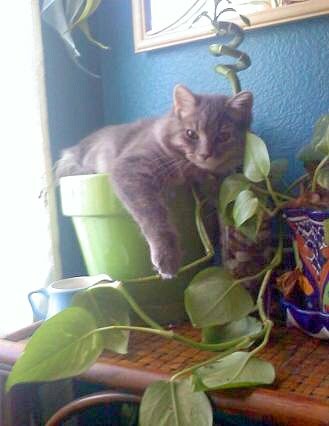 I felt bad for the plant she was squishing but how could I move such a cute little kitty??" "Sasha, here. I is thankful for my new Bobo. I loves it so much. I haven't had one in so long, and even though this is a small one, I still loves it a lot. I is off to go squeak it some more." 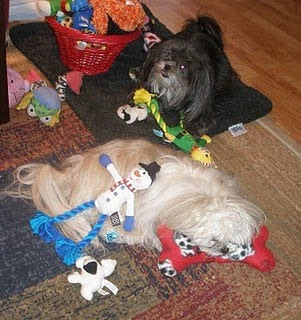 "We are thankful that we have SO many toys!!" 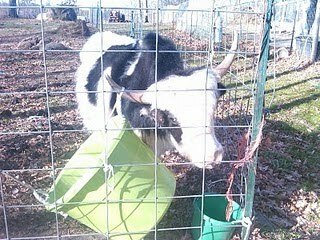 "Kundun, the baby Yak, is thankful for a couple of things...he is thankful his best friend, Wilson the green bucket, cannot fight back, he is thankful he does not live in Tibet where he would actually have to work, and he is thankful he DOES live in Minnesota where it is just cold enough for him to be happy!" "I am tankful dat mommy and da rescue saved me an my brudder from being left out in da cold. Dey found us in a cage wit our mudder in da dumpster in January when we was just pinkies. 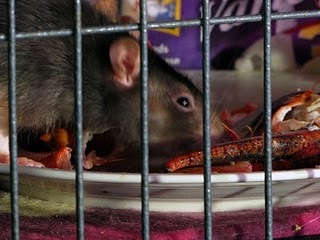 I'm glad dat now, not only am I can be warm, but I can has LOBSTER. Mommy say we eats better dan she do!" "Dingo is thankful that he doesn't realize how small he is. 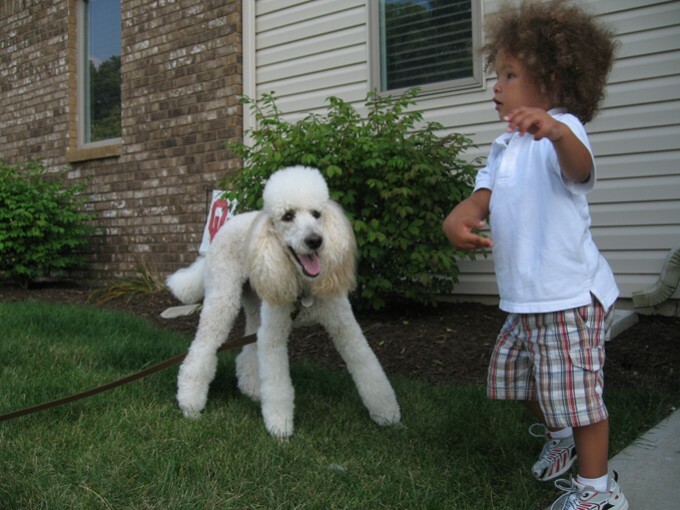 This gives him the confidence to defend his yard and family from potential evil-doers such as postmen, neighbors, neighbor dogs, and any cat, squirrel or bird that gets too close." "Gigi is a rescue cat who is thankful that she now has a safe, warm and loving forever home. 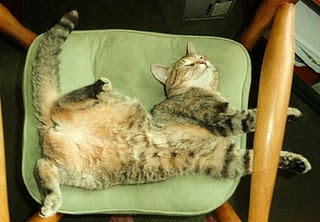 She's also thankful for all the comfy places she has to curl up or stretch out on in her home." November Pet Photo Contest: "What Furbabies are Thankful For"
In honor of Thanksgiving this month's theme is "What Furbabies are Thankful For." Show us your pet with what they are most thankful for. (Like Frau who is thankful for her toy). Send in your photo, slide show, or video of your pet. Add some words to be posted with their pic to go along with the theme. We'll be accepting entries from November 2nd through the 30th noon EST. Visit us in the forums where we'll be hanging out and introducing the new entries. Congratulations Aladdin and Phoenix! 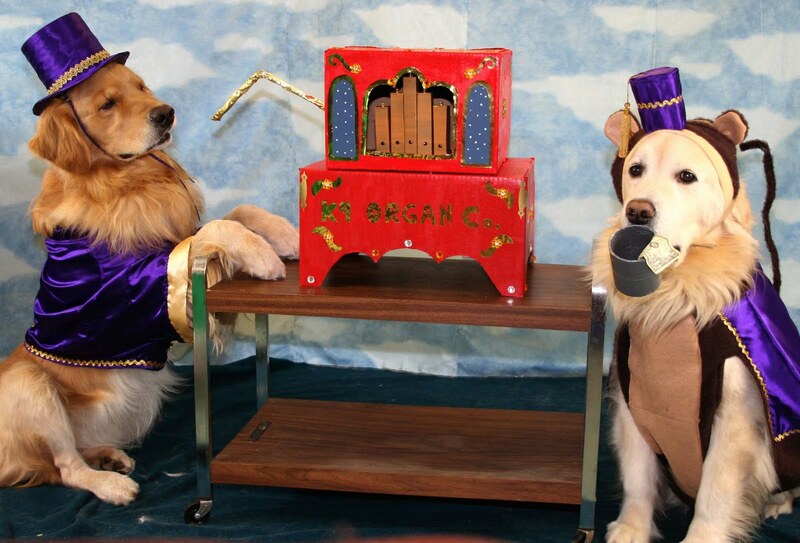 Such wonderful costumes and props! Your photo will be PetsJubilee team store avatar for the month of November. 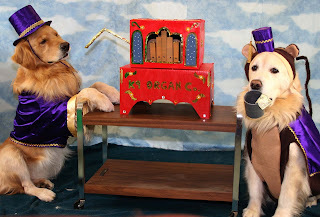 Aladdin and Phoenix have won a free PetsJubilee Pet Sampler box full of goodies, samples, accessories and treats. A new contest will begin tomorrow, so check back for more information.